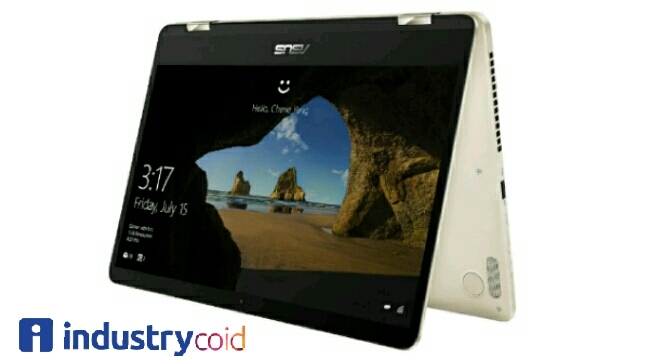 INDUSTRY.co.id - Jakarta - ASUS introduced ZenBook Flip UX461, the latest ultrabook that features flip alias can be transformed into four forms. This premium Ultrabook brings many of its best features from the previous ZenBook line, one of which is an exclusive hinge ergolift hinge that can be played hinga 360o and stylish and trendy design. ASUS ZenBook UX461 is a 14-inch ultrabook 14-inch screen-based operating system Microsoft Windows 10 Home. Carrying the 1920 × 1080 FHD screen resolution, it can be a regular touchscreen notebook, ultra thin tablet, or any device in between. Country Marketing Manager of ASUS Indonesia, Galip Fu said, ZenBook Flip UX461 is a device intended for young professionals who have mobility in running their business activities. "This product is also very fitting along with millennial who have a concern with the world of photography, influencers, creator content, to business travelers," said Galip. The reason that makes this one product match with that segment, is because its light weight only 1,4 Kg and thickness 1.3 centimeter. In addition, battery endurance reaching 12 hours makes this device is ideal for use in various situations. The ASUS ZenBook Flip UX461 inherits the entire DNA that belongs to the classic ZenBook, but this time it is made softer that it gives the impression of being solid. "It has a unibody chassis packed from a sturdy aluminum slab, with a lid that is wrapped in a typical ZenBook ASUS concentric circle pattern," he added. Complementing a compact and elegant design, to enhance from the usage side, ZenBook Flip UX461 has the best graphics components that can be inserted in a thin ultrabook. Nvidia is a graphics chip made by Geforce MX150 with 2GB of video memory capable of providing quality graphics performance qualified for every graphic design application. Geforce MX150 is very qualified for these needs because it has a clock speed that can boost up to 1532MHz. Manufacturing technology used already 14 nanometers and 64-bit technology. Performance, GPU is also faster than its predecessor the Nvidia GTX 950M which is often placed on laptops performance class. 14-inch touch screen with Full HD resolution has been coated In-Plane Switching technology (IPS). Thus the color reproduction becomes much better and can also be seen from a vast point of view without any color gradation. FHD-based displays also offer very high pixel densities, reaching 279ppi. This density is about 40% denser than other 14-inch sail notebooks available on the market. The high level of clarity and detail is also combined with the brightness feature that reaches 350cd / m2 making UX461 suitable for viewing high resolution movies, digital photos, and graphics or working documents with great detail. Large color gamut, up to 100% sRGB and ASUS Splendid technology enrich color reproduction on ZenBook Flip UX461. This feature is very useful for many applications, including watching video and office work or design that requires color accuracy. Not only that, the video performance is also enhanced with ASUS Tru2Life technology that is able to automatically optimize the sharpness and contrast of each pixel on the video frame. Thus, the video looks more clear, detailed and realistic. And if placed in front of the display mode tent, the user will have a powerful set of multimedia displays. ASUS ZenBook Flip UX461 is equipped with various factors that make the work more productive and play more fun. This laptop is one of the first ultrabook on the market that uses powered processors and energy-efficient Intel Core 8th generation and combined with capable graphics. The use of energy-efficient processor is also a major contributor why the battery can last up to 13 hours. Thus, users can still work productively, and play becomes more fun. Specifications qualified this notebook is also supported by high performance LPDDR3 RAM of 16GB 2133MHz and the use of PCIe SSD M.2 of 512GB. For connectivity, a USB 3.0 Type-A port and a USB 3.1 Type-C port are provided to connect today's external devices. Intuitive and accurate navigation is also offered by glass coated touchpad-sized relief and supports ASUS Smart Gesture for multi-touch gestures. The touchpad is equipped with palm-rejection technology and intelligent fingerprint that automatically recognizes and refuses commands due to pressure by the palm of the hand to work smoothly. Not only that, in order to support productivity work, the keyboard on Zenbook UX461 has a backlight feature. This feature is very useful for users who often work until the night or when the room lights have been turned off. To enhance multimedia functionality, the ASUS ZenBook UX461 provides a pair of built-in 1.6W stereo speakers and a digital array microphone. Not only ordinary speakers, speakers made in collaboration with Harman / Kardon has been certified ASUS SonicMaster Technology for the best audio experience art Gesture for various multi-touch gestures. The touchpad is given a palm-rejection technology and intelligent fingerprint that automatically recognizes and refuses commands due to pressure by the palm of the hand to work smoothly. To enhance multimedia functionality, the ASUS ZenBook UX461 provides a pair of built-in 1.6W stereo speakers and a digital array microphone. Not just ordinary speakers, speakers made in collaboration with Harman / Kardon has been certified ASUS SonicMaster Technology for the best audio experience.